Thank you for visiting our page. We are working to improve it. New cases coming soon. Dr. Xavier Allue, Chief of Pediatrics of Hospital de la Seguridad Social, Tarragona, Spain, has contributed this case of Dyskeratosis Congenita. The picture depicts the hands of a 4 y/o girl diagnosed of DC. Dyskeratosis Congenita (DC) is a multi-system disorder characterized by abnormalities of the skin pigmentation, the nails with ridging, destruction and loss of nails, and the mucous membranes in the form of white patches on the tongue. 50% of cases might be associated with abnormalities of the bone marrow, affecting the three series, develping anemia, infections and bleeding disorders. A variety of other abnormalities have been reported including abnormalities of the eyes, teeth, skeletal, gastrointestinal (bowel), genitourinary (kidneys, bladder) and respiratory systems. There is also an increased incidence of malignancy particularly of the skin and gastrointestinal system. Clinical manifestations of Dyskeratosis Congenita often appear during childhood. 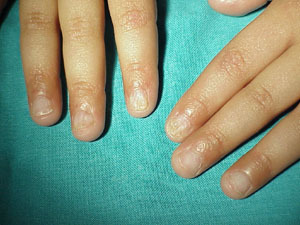 The skin pigmentation and nail changes typically appear first, usually by the age of 10 years. The more serious complications of bone marrow failure, thrombocytopenia and aplastic anemia, as well as malignancies may develop in the second and third decades of life. Some patients may respond to drugs such as oxymetholone. If the bone marrow failure is severe and there is a compatible bone marrow donor treatment by bone marrow transplantation is possible, but the results are poor. The majority (90%) of patients are male and show X-linked recessive patterns of inheritance. The gene responsible for this condition has been identified and providing an accurate diagnostic test. The gene (DKCI) was identified in 1998. Autosomal dominant and autosomal recessive forms also exist. The gene (hTR-RNA component of telomerase) mutated in autosomal dominant DC was identified in 2001.